This is my all-time favorite Trim Healthy Mama compliant protein shake. This is a super creamy low carb shake recipe. I originally found a similar version on the “Raising Godly Daughters” blog, which seems to be on hiatus. For now, this is my adapted version. Enjoy! Combine all ingredients (except for ice) and blend. Add ice til you reach desired consistency. If you use coconut oil instead of MCT oil, add 1/4 cup hot water to shake to melt the coconut oil (this idea is explained in the Trim Healthy Mama book) before adding the ice. Update: The lady who came up with the original version of this recipe (which I had found at Raising Godly Daughters but tweaked a bit) is here at KristyQuinn.com if you want to check her out! P.S. – This recipe is featured in my new incredible resource with one FULL YEAR of meal plans and shopping lists! 365: One Year of Healthy Meal Plans for Busy Families is available now! Thanks! We love it, and you can play around with the recipe to make it more chocolatey or peanut-buttery if you want. I did update the recipe to say it’s 2 Tablespoons of peanut butter. Oh, thanks for the update! Do you think it would be about the same amt if using peanut flour? I’m not afraid to mess with the quantities but I haven’t used my de-fatted peanut flour yet so I have no idea what a good starting point would be. Yes, when I substituted peanut flour I used 2 Tablespoons to experiment, and that tasted perfect to me so I stuck with it. I fixed it! Sorry! It’s 2 Tablespoons. FYI – This isn’t a low-carb recipe. There are 19 net carbs in this shake! It’s delicious but doesn’t fit in the S territory. It’s a crossover. They’re are 32 grams of fat, 422 calories and 28 g of protein. Adam’s 100% natural creamy peanut butter – 4g net carbs. How did you get 6.7? Would love to know if I’m counting wrong. Thank you!!!! The first thing I notice is that for net carbs, you don’t count the carbs in Super Sweet Blend, or any other sugar alcohols. “Net carbs” means those carbs have been subtracted because they don’t impact your blood sugar. 🙂 There are more details about that in the Trim Healthy Mama book. Do you use PB flour or real PB? I didn’t see it in the ingredients. I use real peanut butter, but I have done a no-oil version with defatted peanut flour to make it lighter. I’ll edit it to make it clearer. Thanks! I use it as a metabolism booster, so it’s perfect to add to breakfast smoothies and shakes. I read one of the THM moderators call it “coconut oil on steroids” once. You can’t go wrong with either MCT or Coconut oil though. Curious though, why no MCT oil for the kids? I hadn’t heard that it’s not good for them. I don’t let my kids have it because there is a warning on the bottle, and it’s definitely not safe for kids with certain metabolic disorders. But I know that some people have used it successfully in the ketogenic diet and other anti-seizure diets for kids. Since it’s so confusing, it’s probably a do-your-own-research kind of thing. Sorry I don’t have a solid answer. Hi! I’m the author of the ‘Raising Godly Daughters’ Blog you referred to. My blog has moved to http://www.kristyquinn.net now. I’m also an author and I sell Young Living oils. This recipe was made by a sweet THM mama who just threw everything together and ended up with a phenomenal drink! Sweet thing had no idea how much people would love it! I about fell over when I first tasted it and I asked her if I could share it with others. I can’t remember her name though. It was about a year ago. I’ve made it so much and so many different ways depending on what I wanted. It’s terrific even without the coconut oil or MCT and with only Peanut flour. I, like you use Adams. Thanks Kristy! I’ll go ahead and update your new blog address. Everyone loves the recipe, thanks! My little nursling has a severe almond allergy…so I made this, and only this tweak: instead of the almond milk I used 1/2 c. coconut milk and 1/2 c. cottage cheese. It is AMAZING!!! Totally hitting the PMS craving on the head. Thanks for sharing the recipe! Yay, I’m glad you liked it! I’ll try the cottage cheese addition, too! That was incredible! I subbed extra peanut butter for the cocoa (gives me migraines) and I literally oozed and ahed. Hubby and daughter were highly complimentary too. Thank you! mmm, made this this morning. Delicious! I wrote this recipe in my THM book so I could find it easily. So good! It’s easy to make too. One of my favorite smoothies! actually, while I thought about it I realized the one I use from amazon is coconut oil. Can you use cottage cheese in place of the protein powder, and how much? What kind of thm would this sub. be? Thanks! Any kind of cottage cheese will keep this recipe as an S because of the peanut butter. I have substituted 1/4 cup cottage cheese for the protein powder with good results, but you might want to start with 1/8 cup and taste from there. I honestly can’t taste it, though. It’s one of my favorites! I’m so glad to hear you like it! Hi I’m new to thm. They give your website information in the thm plan book. I needed menu ideas.I have printed February but where do I get the recipes? I don’t do any social media stuff. Sure would appreciate your help. Hi Kim! Beneath the printable calendar menu, you can download the recipe instructions (actually, you really need it because it explains how each meal works with THM and things you may need to tweak). That document has clickable links to each recipe. 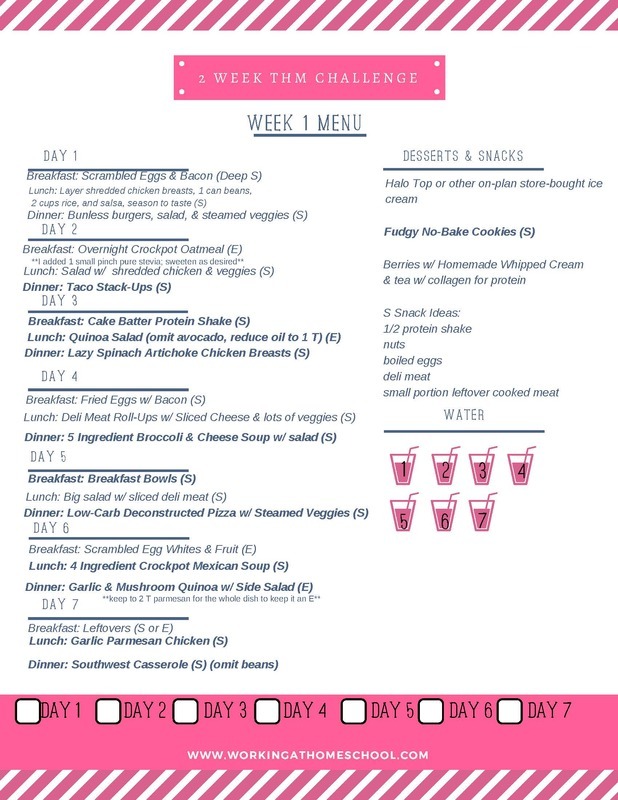 I have lots of menus under the “Trim Healthy Mama” tab at the top of the website if you need more inspiration. I hope that helps! I just made this – so easy and yummy! Thanks for sharing this! Delicious! This was my first THM shake. Thank you for sharing such a yummy recipe. I’m very new to THM… as in still getting through Week One! The shake sounded so easy and fun, and it was! So glad to tap into your resources. Thank you so much! So I get really sick if I eat whey protein, so is there something I can substitute for it? I had to hide from my toddler because he wanted to steal it from me. NEVER. Thanks for the lol this morning, Nicole! I need some rainbows and unicorns around here today. ? Jen, I’ve been searching but can’t find a “Print” button for this recipe. Is there one? I’m sorry, Pat, this one doesn’t have a print button! I’ll try to get that fixed soon, thanks for letting me know! I love this shake! It’s great for a snack. I always use cottage cheese and I don’t think it takes away from the flavor at all. Thank you for sharing this recipe! This is my favorite milkshake so far. YUMMY! Great, thanks for taking the time to comment, Melonie! I’m so glad you like it! Could you substitute collagen for protein powder? Hi Megan! Yes, you definitely can! I just want to say thank you for putting this up. I was looking for something different and yum and saw this. So now it is breakfast time or make that brunch as I slept in and it is so yummy. I didn’t have vanilla protein but I did add extra vanilla essence instead to the protein I did have and it was/is divine. Appreciate all the effort you put in to make it easy for us mummas working this out. Thanks again. Thanks Lisa! I’m so glad you liked it! That sounds like a great substitution! This shake is amazing!! So simple to make and only takes a few minutes. Thanks for sharing. I’m loivng this as a perfect breakfast on the run! Yay, I’m so glad you like it, Sarah! Thank you! It’s one of my favorites!